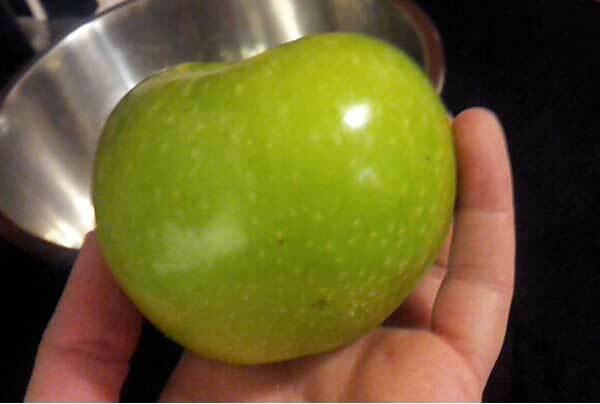 It’s apple season here in NYS… it’s not been a great apple season by any stretch because the weather..well has been crap for apples. Srsly dude. But that doesn’t mean I’m not going to make a pie. Except every time I make it, I’m reminded of when I was a kid in 4-H, and I entered my pie at the Altamont Fair. My pie took first place. I didn’t win much as a kid. I was (am) socially awkward, clumsy and kind of a goof. Sports? ha! sports were the only reason I didn’t get a 4.0 which just perpetuated my dislike for phys ed. I remember the judges saying it was too pretty to cut. They didn’t even taste it! That was kind of a drag because it is super yummy. But still.. years later, I still say this is my “award winning pie”. But there is nothing special about this pie. Those pie crusts got stacked in a cooler and brought home. Then the next day (I think?) a good chunk of the club came over and we set up an assembly line.. We didn’t have kids over to the house very often so this was a big deal. 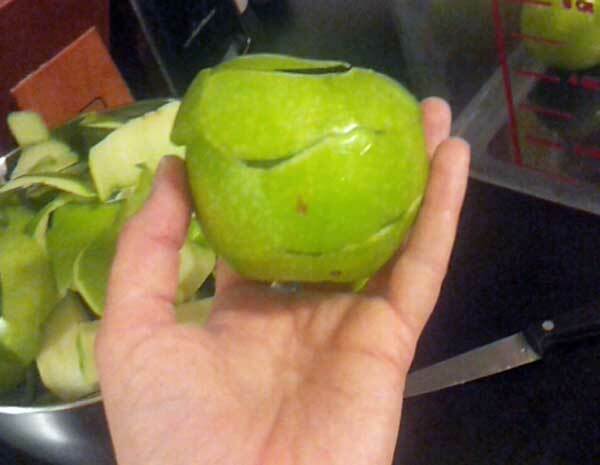 Someone would peel apples. Someone would toss them with spices and sugar.. someone would fill the crust.. someone would make the crumb topping and someone would top them off… and someone would pop them in the oven. I remember us all laughing at our sticky hands.. I remember sneaking slices of sugary apples when we thought my mom wasn’t looking. It was one of of my favorite times in 4-H because I felt a sense of community.. I was with people I knew who were enjoying the things I enjoy. It still feels like one of the first times I really fit in anywhere. We sold those pies as a fundraiser for the club. I don’t remember much about that bit and the next time I talk with my mom, I’m going to ask her about it.. but I’m pretty sure that we gave a few away to a local nursing home. 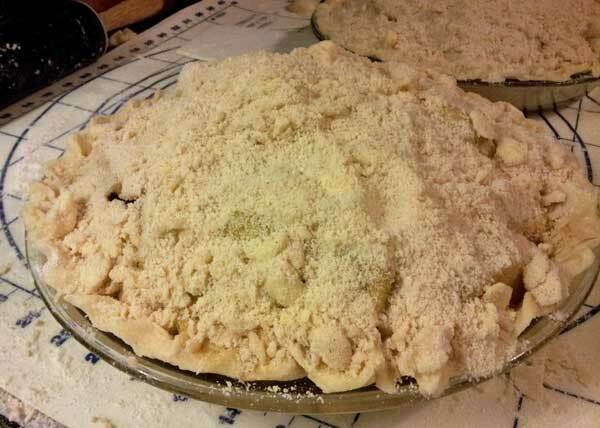 It should also be noted that the recipe card for this pie say’s that it’s “Dad’s Favorite Apple Crumb Pie”. Dad, meaning my grandfather, who recently passed. My relationship with my fraternal grandparents was … odd. They had difficulty with showing affection as did I. (I still struggle sometimes). There weren’t any “I love you”s or “good jobs”.. hugs were rare. They used to come by the house when they knew no one was home to drop off birthday presents. Phone calls were unheard of. There were reasons for this that I’m not going to get into, but let’s say that they loved us the best they could. I don’t know what possessed me but when I was in my late teens, I baked this pie and brought it to my grandparents house.. just because. They weren’t home.. so I grabbed some scrap paper from the car and left it on their steps with a note. They called me… they called me on the actual phone and thanked me… this was.. wow. HUGE. LB doesn’t like apple pie. I didn’t know that when we got together. I made her this apple pie. She likes it. It’s the only apple pie she likes. I love that this apple pie is the exception. She’s an exceptional woman and I love that she likes this pie. But it’s so much more. It’s a memory. It’s a feeling. It’s family. So when you read this recipe and think “eh.. it’s just a pie” I want you to think about that family recipe you have that’s nothing special.. There is nothing special about this pie. But you should make it anyway. 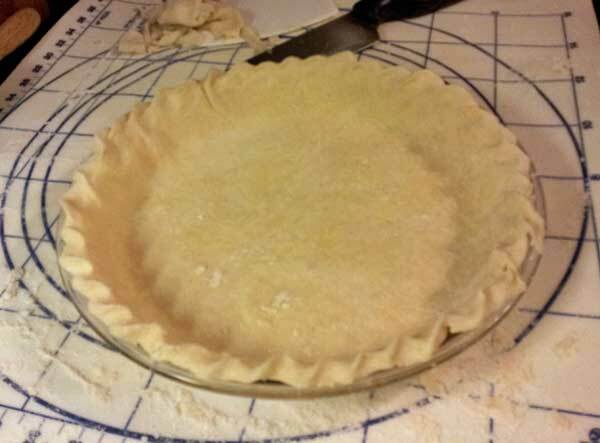 Roll out the pie crust and line a 9 inch pie pan with it. Toss with brown sugar, 1 tsp cinnamon, and nutmeg. 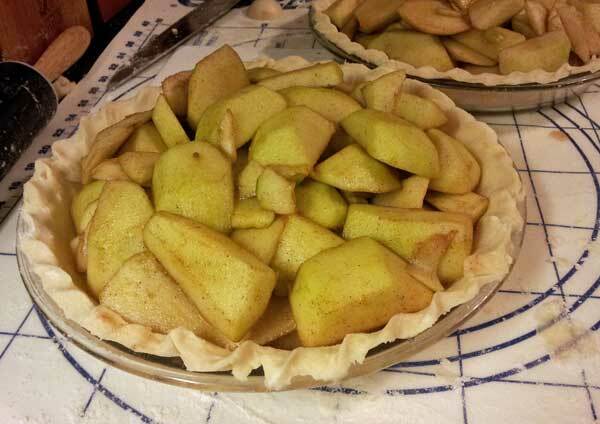 Fill the crust, unbaked with the apples. Don't worry if there seems to be too many. Crumble the butter, flour, sugar and ½ cinnamon together to make the crumb topping. Top the pie with the topping. Use it all. Really. 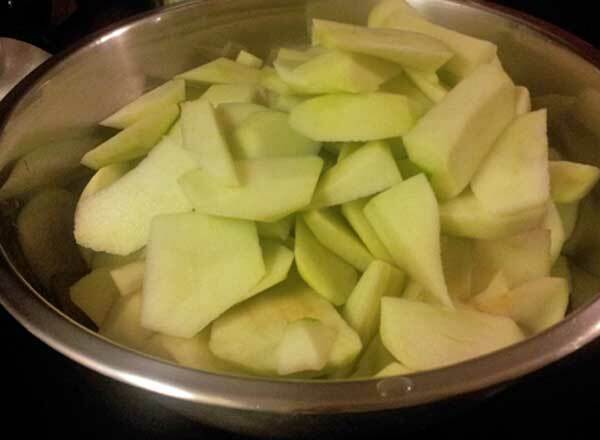 Reduce the heat to 350 degrees and bake for 30-35 minutes until bubbling and apples are baked but still firm. And I want you to make that recipe.. just because… just because there is nothing special about it except what it means to you. So many of my memories center on food, especially the smells, so I can relate so completely. Thank you for reminding us how important these memories are.